Motivational Posters and Cards – Brighten up your classroom, therapy room or hallway with these colorful motivational posters and cards. This is a digital download of 16 motivational posters and 16 small cards of the posters. Hang them on the wall or toss them in a lunch box as a motivational tool. Immediately following payment, the PDF document will be available electronically. Summary of the Motivational Posters and Cards: This digital document includes 16 motivational posters (size 8.5″x11″) and 16 smaller versions (2.5″x3.5″) of the posters. 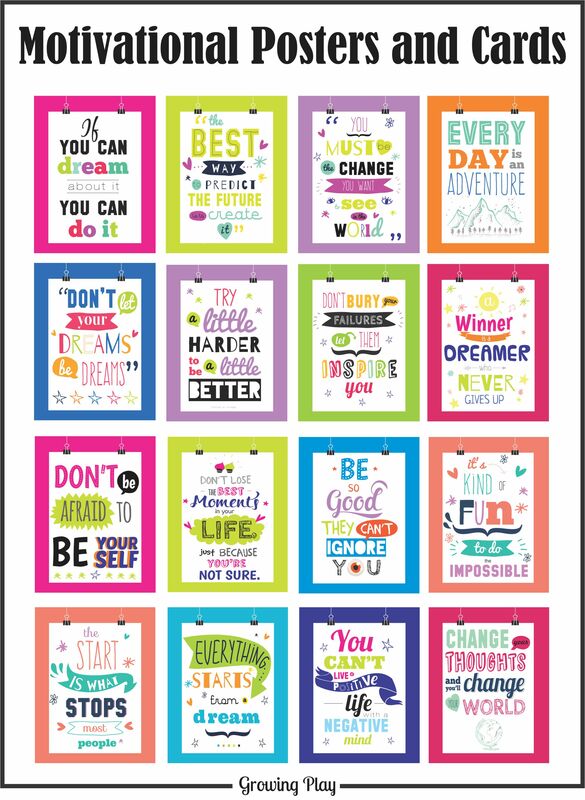 Hang the posters on the wall or hand out the smaller cards to encourage children to accomplish goals, reach dreams and achieve success. Click on the picture above to view all the posters. Remember this is an electronic book. Following payment, you will receive a link to download the book. Looking for more motivational tools?